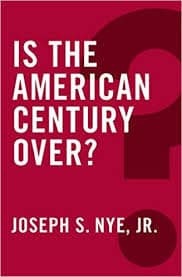 Joseph Nye — Is the American Century Over? 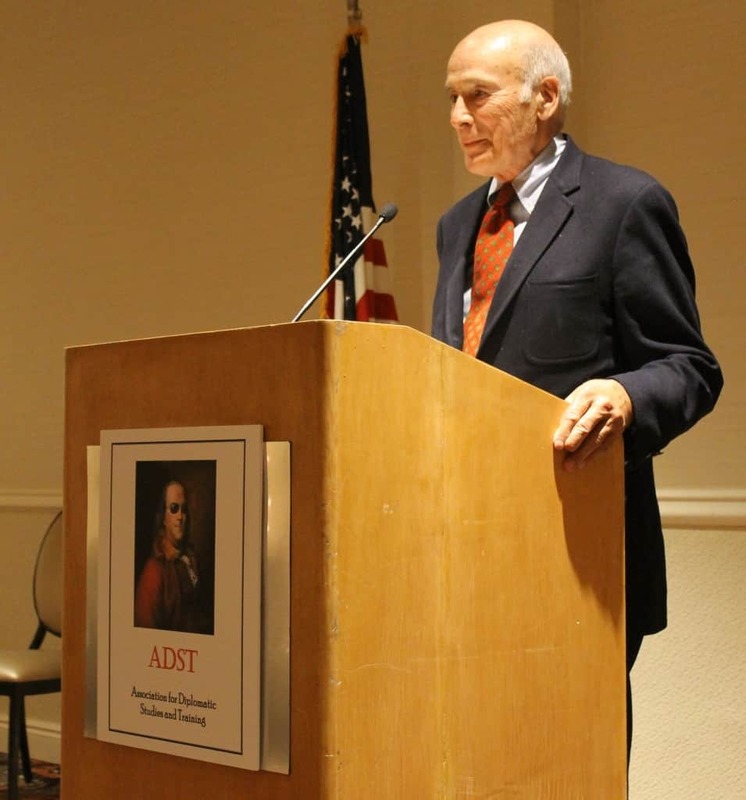 In April 2016, ADST gave its Cyrus R. Vance Award to Dr. Joseph Nye. Named in honor of one of our most treasured career diplomats and former Secretary of State, this award recognizes outstanding achievement in advancing the study of U.S. diplomacy. Joseph Nye has been the preeminent thought leader on the issue of power dynamics and relationships connecting global actors. His seminal book Power and Interdependence introduced the world to neo-liberalism –now one of the major theories in the field of international relations. He went on to pioneer another ground-breaking concept – soft power– which illustrates international actors’ ability to shape the preferences of others through appeal and attraction rather than coercion and force. In addition to his intellectual and scholastic leadership as the Dean of Harvard’s Kennedy School of Government, Dr. Nye has been a dedicated public servant. He has served as the Assistant Secretary of Defense, Under Secretary of State and Chairman of the National Intelligence Council. Dr. Nye has been recognized on numerous occasions as one of the most influential figures in American foreign policy. He is University Distinguished Service Professor at Harvard and author most recently of Is the American Century Over? Go here to read Cyrus Vance’s oral history. I want to thank the Association for Diplomatic Studies and Training for honoring me with the Cyrus R. Vance Award for Advancing Knowledge of Diplomacy. It is particularly meaningful to me because I had the privilege of serving Cy Vance as a deputy Under Secretary of State from 1977 to 1979. He was true statesman and a model of integrity. At that time, there was widespread public debate about American decline and belief that the Soviet Union was about to surpass us. Not only did this not happen, but in little more than a decade there was not even a Soviet Union. As I show in my recent book, Is the American Century Over? Americans frequently misunderstand our place in the world. We oscillate between triumphalism and declinism. Charles Dickens wrote that the Americans always think they are in “an alarming crisis.” After the Soviets launched Sputnik in 1957, we believed we were in decline. When Japan’s manufacturing outstripped ours in the 1980s, we thought the Japanese were ten feet tall. In the aftermath of the Great Recession of 2008, a majority of Americans mistakenly thought that China was about to overtake the United States. The result is a foreign policy debate that is often divorced from reality. The Middle East is in turmoil and American influence in that region has diminished. 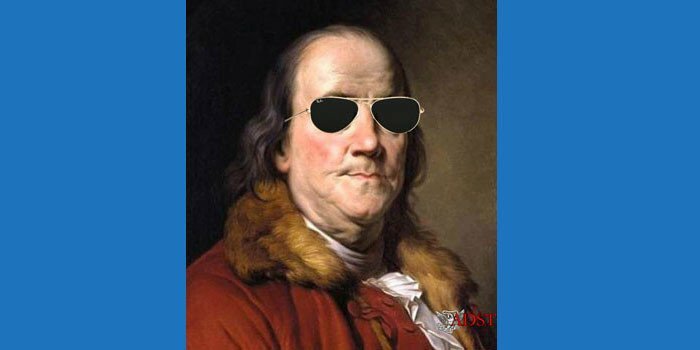 But the causes are the revolutions in the Middle East, not American decline. It is a mistake to generalize from the Middle East to the rest of the world. In the 19th century, following George Washington’s advice to avoid entangling alliances and the Monroe Doctrine focused on the Western Hemisphere, the U.S. played a minor role in the global balance of power. The U.S. did not keep a large standing army, and in the 1870s the American navy was smaller than that of Chile. The U.S. did not shun military power (as Mexico and native American nations can attest), but isolationism was our attitude toward Europe and the global balance of power. In the short Spanish-American war of 1898, the U.S. took the colonies of Cuba, Puerto Rico and the Philippines from a declining Spain; but that period of formal global imperialism was brief. A big change was American entry into World War I when Woodrow Wilson broke with tradition and for the first time sent American men to fight in Europe. Moreover, he proposed a League of Nations to organize collective security on a global basis. After the Senate rejected American membership in the League, the troops came home and America “returned to normal”. Though it was now a major factor in the global power balance, the United States became virulently isolationist in the 1930s. Not even the eloquence of Franklin Roosevelt could persuade the American people to stand up to Hitler’s threat. We had no alliances in the 1930s and the result was a disastrous decade marked by economic depression, genocide, and world war. The turning point and the beginning of the century in which the United States has been central to the global balance of power was Harry Truman’s post-war decisions that led to permanent alliances with a military presence abroad. When Britain was too weak to support Greece and Turkey in 1947, the U.S. took its place. We invested heavily in the Marshall Plan in 1948, created NATO in 1949, and led a United Nations coalition that fought in Korea in 1950. In 1960, we signed a security treaty with Japan. These actions were part of the strategy of containment. As George Kennan (and others) saw the world after the war, there were five main areas of industrial productivity and strength; the U.S., the Soviet Union, Britain, Europe and Japan. It was in the American interest to ally with three of the five as a means of containing the growth of Soviet power. American troops remain in Europe, Japan, Korea and elsewhere to this day. While Americans have had bitter debates and partisan differences over intervention in developing countries like Vietnam and Iraq, the bedrock consensus in American foreign policy for seven decades has been our alliance system. Now it has been called into question by a major political party presidential candidate. That would be a radical change in American foreign policy. As Cyrus Vance well knew, our alliances have reinforced our leadership and slowed the dangerous proliferation of nuclear weapons. While presidents and secretaries of defense have sometimes complained about the levels of alliance defense spending, they have always understood that alliances are best judged as stabilizing commitments like marriages rather than as temporary real estate bargains. Even though it has often complained about free riders, the United States has been in a position to steer the bus. What is the future of this American century? My guess is that among the range of possible futures, ones in which a new challenger such as Europe, Russia, India, Brazil or China surpasses the United States and precipitates the end of the American centrality to the global balance of power are not impossible, but not very likely. The distinguished British strategist Lawrence Freedman notes that among the features that distinguish the U.S. from “the dominant great powers of the past: American power is based on alliances rather than colonies.” Alliances are assets; colonies are liabilities. As an overall assessment, describing the 21st century as one of American decline is likely to be inaccurate and misleading. More important, it can lead to dangerous policy implications if it encourages countries like Russia to engage in adventurous policies; China to be more assertive with its neighbors, or the United States to over-react out of fear. America has many problems, but it is not in absolute decline, and it is likely to remain more powerful than any single state in the coming several decades. 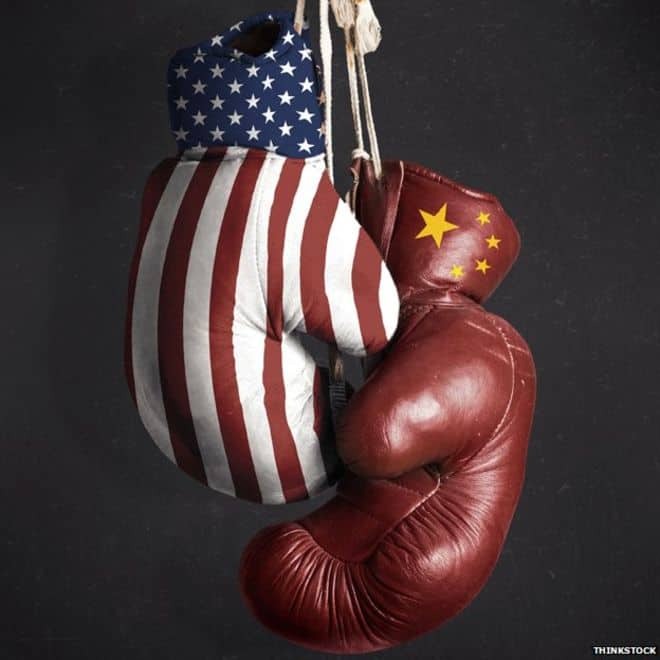 The real problem for the United States is not that it will be overtaken by China or another contender, but that it will be faced with a rise in the power resources of many others – both states and non-state actors. The real challenge will be entropy – the inability to get work done. We will face an increasing number of new transnational issues which will require power with others as much as power over others. In a world of growing complexity, the most connected states are the most powerful. As Anne-Marie Slaughter has recently written in the Financial Times, “diplomacy is social capital; it depends on the density and reach of a nation’s diplomatic contacts.” And the U.S. comes first in Australia’s Lowy Institute ranking of nations by number of embassies, consulates and missions. 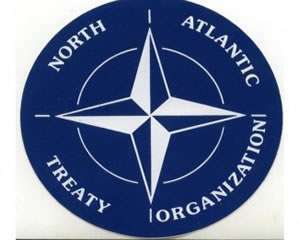 Washington has some 60 treaty allies; China has few. In political alignments, The Economist estimates that of the 150 largest countries in the world, nearly 100 lean toward the United States while 21 lean against it. A key question for American foreign policy is how to bolster institutions, create networks and establish policies for dealing with the new transnational issues we will confront in this century. Leadership by the largest country is important for the production of global public goods, but domestic political gridlock often blocks such leadership. For example, the U.S. Senate has failed to ratify the Law of the Seas Treaty despite its being in the national interest and the fact that the U.S. needs it to bolster its position in the South China Sea. Similarly, Congress delayed in fulfilling an American commitment to support the reallocation of IMF quotas from Europe to China, and in terms of leading on climate change, there is strong domestic resistance to putting a price on carbon emissions. Similarly, there is growing domestic resistance to international trade agreements. Such attitudes weaken the ability of the U.S. to take the lead in dealing with global public goods, and that in turn can weaken the legitimacy and soft power that are critical to the continuation of American leadership. How does the United States maintain the credibility of its alliances, if other countries perceive the country as turning inward and constantly granting ourselves exemptions? In conclusion, the American century is not over, if by that we mean the extraordinary period since 1945 of American pre-eminence in military, economic and soft power resources that have made the United States central to the workings of the global balance of power, and to the provision of global public goods. Contrary to those who proclaim this the Chinese century, we have not entered a post-American world. But the continuation of the American century will not look like it did in the 20th century. The American share of the world economy will be less than it was in the middle of the past century, and the complexity represented by the rise of other countries as well as the increased role of non-state actors will make it more difficult for anyone to wield influence and organize action. Now, with slightly less preponderance and a much more complex world, our ability to sustain the credibility of our alliances as well as establish new networks will be central to the success of American diplomacy.